What's changed in version 0.7? All three codecs have been updated to their current versions. Some internals have also been changed to allow LACE to function with the Batch File Generator. Note also CSG must be updated to v1.9b (or newer) to ensure LACE/CSG interoperability. What's changed in version 0.6? Ogg Vorbis, baby! Also, dialog boxes should be on top, and support for CSG's upcoming batch-LACE mode is included. LACE is a lossy compression engine for SAW, currently supporting two popular MP3 encoding engines -- Blade Encoder (bladeenc.dll) and LAME Encoder (lame_enc.dll). Either, or both, of these .dlls must be placed in either your Windows System folder or in your SAW folder. It is recommended to install both Blade and LAME and try each at your preferred settings; they do sound quite different, and opinions will vary. 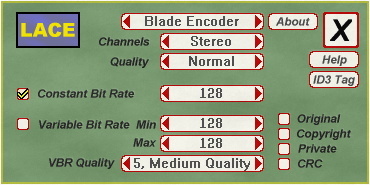 At the present time, the MP3 Encoder's installer installs versions of the Blade, LAME, and VorbEnc encoders into your SawStudio folder.